Apple Inc, announced their latest and yet cheaper version of the famous iPhone, it's called 'iPhone 5C.' 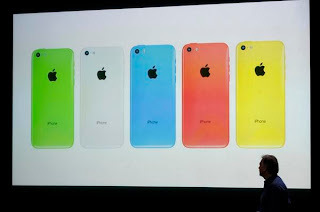 This new iPhone will have five different colors and the price will start at 99 dollars with a US carrier contract. iPhone 5C has five (5) colors such as, blue, white, pink, yellow and green. According to ABS-CBN News report that iPhone 5C has 16Gb of memory capacity and it will be sell for as low as $99 with a US carrier contract, half the cost of earlier iPhone base models. Apple chief Tim Cook said, "The business has become so large that this year we are going to replace the iPhone 5 and we are going to replace it with two new designs." Yes, you read it right! Apple unveiled two new iPhone versions, the other iPhone device was called, iPhone 5S, you may click the link for more details. Comments or suggestions about "Apple iPhone 5C, Cheaper iPhone with 5 Colors, Specs and Price" is important to us, you may share it by using the comment box below.